Combine the quinoa, water, and salt in a small pot with a tight fitting lid. Bring to a boil, then reduce heat to low and cover. Cook for 15 minutes or until water is absorbed. Set aside. Meanwhile, pat the tofu dry. Heat 3 tablespoons GrapeOla® Grapeseed Oil in a large nonstick skillet over medium heat. Add the tofu and cook, turning once, until well browned and slightly crisp, about 15 minutes. 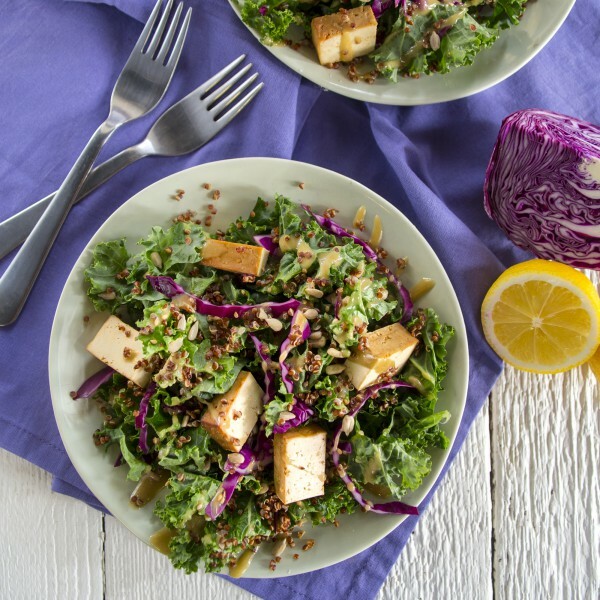 While the tofu is cooking, add 1 tablespoon of the lemon juice and rub it into the kale with your fingers until the kale softens, 1-2 minutes. Whisk the remaining lemon juice with the tahini and honey in a small bowl; add the remaining 2 tablespoons GrapeOla® Grapeseed Oil and whisk until smooth. Whisk in 2 tablespoons water and season with salt and pepper. Add 2 tablespoons dressing to the kale; add the cabbage, onion and a pinch of salt and toss well. Fluff the quinoa with a fork and add to the kale mixture along with the sunflower seeds and sesame seeds; toss to combine and drizzle remaining dressing.